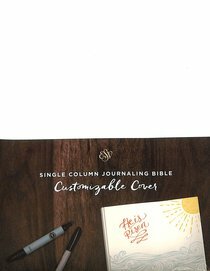 About "ESV Single Column Journaling Bible Customizable Cover (Black Letter Edition)"
The ESV Single Column Journaling Bible provides generous space for writing and reflection beside the Scriptures in lined, 2-inch margins on thick, cream-colored, opaque paper. In addition to providing a place for readers to capture their spiritual life within the pages of their Bible, this brand-new edition features a fully customizable cover allowing for even more creativity on the Bible's exterior. A white hardcover surface acts as a blank canvas, allowing readers to personalize their Bible with pens, paint, or markers.